The Chronic ROTOXKIT F contains all the materials necessary to perform three short-chronic bioassays. The test species is the freshwater rotifer* Brachionus calyciflorus. · The ACUTE ROTOXKIT F is a 24h assay based on mortality of the test organisms, with calculation of the 24hLC50. · The SHORT-CHRONIC ROTOXKIT F measures the decrease in reproduction of the rotifers under toxic stress after 48h exposure, with calculation of the 48h median growth inhibition (48hEC50). NOEC and LOEC values can be determined with specific data treatment program. · Standardized micro-plate test containers constructed of biologically inert materials ensures uniform exposure conditions. · Minimal equipment needed for test performance: dissecting microscope – small incubator – conventional laboratory glassware. · Tubes with cysts, concentrated hatching and toxicant dilution medium, hatching/test containers and micropipettes for the transfer of the organisms. · For the short-chronic tests : tubes with live micro-algae immobilized in algal beads, a vial with matrix dissolving medium, tubes with a pre-feeding powder and a vial with Lugol fixative for easy counting of the rotifers. · Specification sheet with batch number of the cysts, the media and the algal beads. · Specially designed « all in one » micro-plates with hatching trough, rinsing troughs and 36 (acute) or 48 (short-chronic) test wells for easy and rapid transfer of the test organisms under a dissecting microscope. · Total performance time approximately 1h for the acute assays and 2h for the short-chronic tests. · Very chemical dependent, but highly sensitive to particular chemicals and mixtures. · Growth inhibition NOEC’s determined with the short-chronic ROTOXKIT F are ecologically meaningful thresholds for the impact of toxicants on this important group of biota in aquatic food chains. 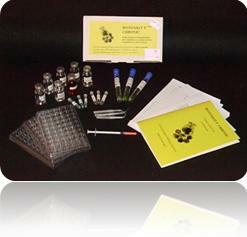 · The acute toxicity test with Brachionus calyciflorus is an ASTM Standard since 1991. 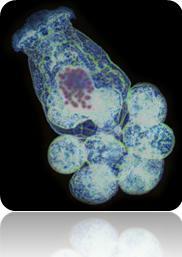 · A 48h growth inhibition test with rotifers (with Brachionus calyciflorus as test species) is proposed in the 20th Edition (1998) of Standard Methods for the Examination of Water and Wastewater; the short-chronic rotifer micro-biotest is also under consideration as a new AFNOR Guideline in France.